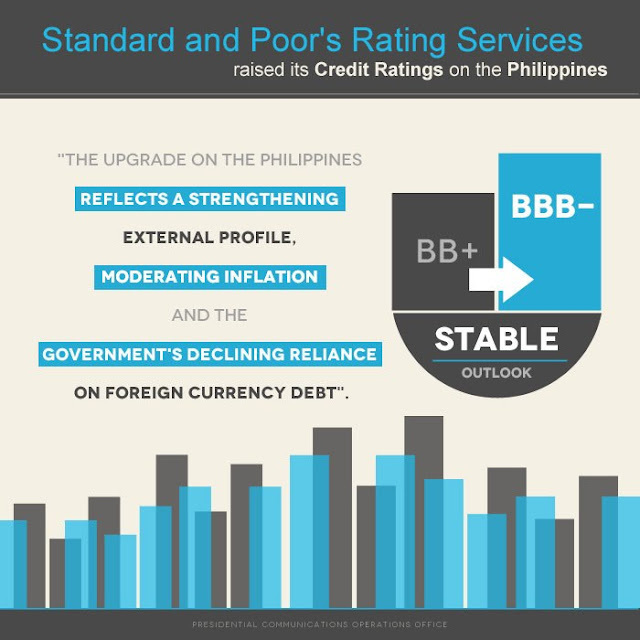 Standard & Poor’s, a known to investors worldwide as a leader of financial- market intelligence gave the Philippines an investment grade credit rating from BB+ now BBB-. This is the second investment grade rating after Fitch Rating's gave the Philippines its first-ever investment grade rating in late March. Moody’s investment grade rating, soon. We are receiving so much blessing this year. Go Philippines. Go Filipinos, continue to shine. Standard & Poor’s said in a statement that the Philippines has created a substantial foreign exchange reserve buffer with its current account surpluses, which will be sustained "over the next several years" by continued remittances from the country's large overseas labor force and the growing business process outsourcing industry. In a latest news from bloomberg.com, it says that we also beats Indonesia in gaining Standard & Poor’s Investment Grade, Below is some of the excerpts from the said news. "Philippine stocks rose to a record after it beat Indonesia to win an investment grade from Standard & Poor’s, as President Benigno Aquino outshines Susilo Bambang Yudhoyono in improving government finances and spurring growth. The rating on the Philippines’ long-term foreign-currency- denominated debt was raised one level to BBB- from BB+, with a stable outlook, S&P said in a statement yesterday. In contrast, the assessor revised its outlook on Indonesia’s BB+ rating to stable from positive."